Above: The Gallup 9th Street Flea Market. Photograph by RAH Photography. 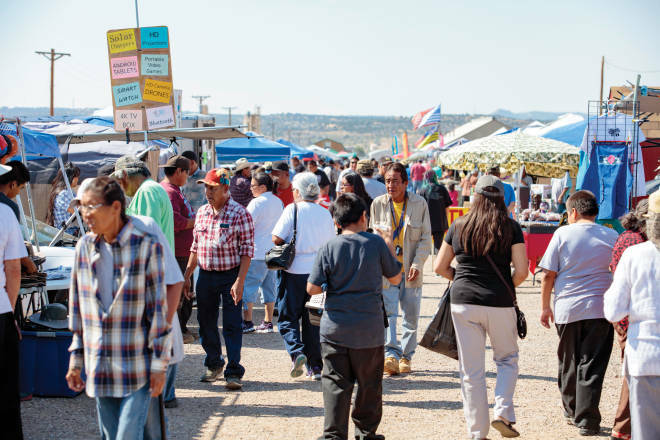 On any given Saturday, you can check out the Gallup 9th Street Flea Market, one of the largest Native American markets in the country. More than 500 vendors offer jewelry, pottery, animal fetishes, Pendleton pillows, cowboy hats, paintings, herbal remedies, farm tools, and aprons made from Blue Bird flour sacks. The atmosphere is as down-home as it gets. You’ll definitely want to try mutton stew, Navajo fry bread, hot fresh tamales, horno-baked Zuni bread, and milky horchata. Best of all, it’s living culture and history, and friendly artists are happy to talk to you about their work. Ask questions about provenance and quality if you’re buying turquoise or silver. Open Saturdays, 9 a.m.–5 p.m. Arrive early for easy parking (gallup9th.com).